As a fighter, there is nothing worse than possessing the desire to train, while lacking the resources necessary to apply this motivation. Consider morning roadwork as a classic example. Roadwork has been a staple in the conditioning of combat athletes since the beginning of time. But what happens on those mornings when you are unable to run due to poor weather conditions? What can a fighter do when outdoor roadwork is not an option? This abbreviated list will allow one to improve work capacity, endurance, mental toughness, and more. You do not need an outdoor track to perform these workouts. If the weather is not cooperating, you can perform your roadwork indoors. Let’s look at a sample week. This program is intended for an experienced fighter who is preparing for competition. Perform 4 to 6 rounds. Each round should range from 2 to 3-minutes, depending on the condition of the athlete. Throughout the 20-minute session, integrate fast paced bursts (ex. 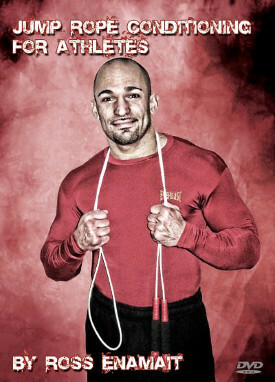 double unders) with less intense skipping patterns. This rope session will simulate a fartlek running session. For more jump rope routines and instruction, check out this DVD. Interval training can be performed with countless tools (ex. jump rope, stationary bike, Concept 2 rower, Versa Climber machine, etc.). Tabata intervals are to be performed with 8 x 20 second work periods, each separated by 10 seconds of rest. For more information on the Tabata protocol, check out this article. Perform these roadwork alternatives early in the morning. You can then rest throughout the day, before returning to the gym in the evening to focus on skill work (ex. sparring, bag work, partner drills) or strength work. This weekly routine integrates a mix of anaerobic work, with sustained aerobic work via the 20-minute jump rope sessions. This program is not intended for continued use, but does offer an option when the weather is not cooperating. There is no excuse to skip out on your roadwork. Work around the weather. You will be thankful on fight night.